Dictator for Life, 44 B.C. Julius Caesar was a successful general of the Roman Republic who deftly translated his battlefield renown into political power. 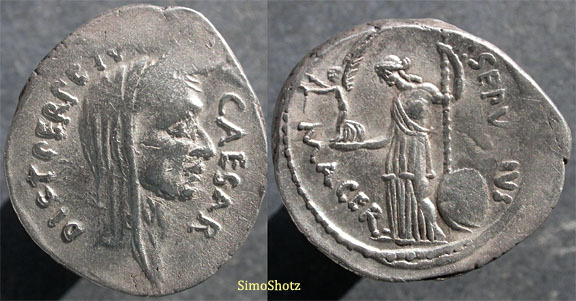 His assumption of the title “Dictator for Life” created a crisis in the Senate; when his image appeared on coins (like the one above) he was accused of having monarchical ambitions. His assassination by outraged republicans led to the civil war that eventually ended the Republic and gave birth to an Empire.